A splitting maul is the best and most versatile tool to use when splitting wood by hand. What are the best types of splitting mauls? What are the different sizes and how are they used? Read below, you'll find out everything you need to know. What is a splitting maul and how is it different than an axe? A maul is one part really thick axe, and one part sledgehammer. 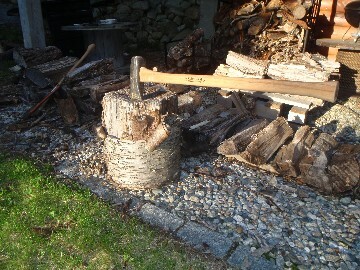 It is a tool that has one purpose- splitting wood. It can weigh anywhere from 6-12+ pounds and usually has a handle length between 30-36". Mauls barely have sharp edges and get thick in a hurry. This is because they are meant to split the wood apart. Unlike a chopping axe that is meant to chop the wood against the grain, a maul splits wood with the grain. For this reason, they need to be thick to get the job done. I consider mauls to be the most versatile wood splitting tool, but they do have advantages and disadvantages. They are much better suited than axes for splitting difficult species of wood. Because of their weight and shape/size, they get the job done much better than an axe. Since the back of the maul is essentially a sledgehammer, you can use it to pound steel splitting wedges into really difficult pieces of wood. It can take less effort than an axe on those species of wood that are difficult but not impossible to split(red maple for example). I say this because a properly placed blow can usually split the wood without much exertion on your part, basically just the weight of the maul will get the job done. They are heavy! If you are splitting easy-to-split species, you'll tire out more quickly than if you were using an axe. Swinging an 6 or 8 lb maul takes a lot more effort than a 3 lb axe. It is certainly something to take into consideration if you have a lot of wood to process. They are harder to control than axes because of their weight. You may feel that the splitting maul is swinging you at times. As a result, your accuracy may suffer. Get a maul! I don't care if you only want to use axes, a wood splitter, or even cheap labor (some poor unwilling family member). Get one anyway. I promise that you will be happy that you did. They come in handy. I suggest either the 6 or 8 pound models depending on your strength. Personally I use a 6 pounder. I like it because I can really get a strong swing without tiring quickly. There are mauls out there that wiegh 12+ pounds, but I think they are useless. Who wants to swing something that heavy? Both fiberglass and wooden handles are sold. I highly recommend the fiberglass handles because they won't break easily like a wooden handle. It only takes a wooden handle a few hard missed hits before it will start to break. I've only seen a fiberglass handle break once and it was after years and year of abuse. I have to admit that I do prefer the wooden handle myself. But that is purely because I am an axe snob and like the feel of the wooden handle. Also, I am used to swinging mauls and axes and rarely miss my target(unless I'm tired, then I'll switch to a maul with a fiberglass handle). As I have said many times before, you usually get what you pay for here. You can expect to pay between 20-70 dollars for a quality maul. The good news is that a quality splitting maul will literally last you a lifetime.